I was always drawn to this species since I first noticed the delicate compound leaves and interesting growth pattern it exhibits. The Brazilian Rain Tree is native to South America,more specifically Brazil. It is a tree that can grow to over 15 feet tall, and spread over 18 feet in diameter. It has crooked stems and branches, thorns, and a peeling grayish bark. It has compound leaves with 3 pairs of bipinnate leaves. It has white flowers and corkscrew shaped seed pods. This species’ history as bonsai in the United States can be traced to the late Jim Moody of Jupiter Bonsai located on the East coast of Florida. His sister in law sent him seeds she collected while in Brasilia, Brazil. He planted the seeds and was lucky enough to have 5 germinate. Not knowing then what he had the tree was originally misidentified as Samanea saman. Later the tree was correctly identified as Pithecellobium tortum. Jim grew the first of his raintrees for 7 years in a small cascade bonsai pot styling it as an informal upright and getting to know the species. This specimen went on to become nationally recognized through Bonsai Today magazine and a book titled ‘Great American Bonsai’. The tree to this point had been solely trained by directional pruning; no wiring was used in the styling process. The unique features of this species such as the twisted trunk, exfoliating bark, and delicate compound leaves made it an ideal candidate for bonsai. Jim Moody began growing these trees from cuttings taken from his original tree. Today numerous nurseries and websites offer Brazilian Rain Trees for sale. Many of the ones in this country are descendants of Jim’s original tree. As mentioned raintrees exhibit many exceptional qualities for bonsai. The tiny compound leaves will fold slightly shut at night, and during rain. The trunk, which begins fairly cylindrical as a young tree, will begin to contort and twist as it matures. 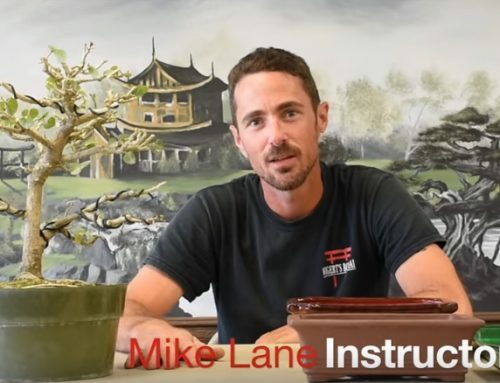 Allen Carver, grandson of Jim Moody and current owner of Jupiter Bonsai, points out that the tree will ‘twist’ at the points branches exit the trunk. In a mature tree these ‘twists’ create a unique taper. The bark will also begin to exfoliate as it matures. Thorns growing on the trunk and primary branches may be removed and will not grow back in the same location. The new growth is very flexible when green and responds well to wiring. When trimming branches, cut back to just above a node to prevent die-back of the branch. Trees may be heavily pruned and will break back well with new growth on older branches. Repotting is best carried out during the warm summer months. You may prune roots extensively, however remember to balance this with pruning of the foliage and then keep the tree in a shady location for 7 to 10 days. Raintrees prefer a well-draining soil; use a well balanced fertilizer year-round for optimal growth. They are relatively pest free; aphids will occasionally attack new growth, but are easily treated. They are susceptible to root nematodes, avoid placing your potted trees on the ground here in Florida as this can allow access for the nematodes. They can cause a weak, and sickly root system, and ultimately if untreated, death of the tree. Protect the trees in a greenhouse or by bringing it indoors in temperatures below 45 degrees. Raintrees may be grown as indoor bonsai if adequate lighting is provided. movement and a weathered ‘aged’ look. Marcelo collects these large trees and does an excellent job turning them into specimen bonsai. He has had his trees chosen severaltimes in the JAL World Bonsai Contest. He was gracious enough to allow me to use photos of his specimens for this article. Marcelo’s photos show the diversity in which raintrees can be styled, from informal upright to cascade style and just about everything in between! Many of them as you can see bloom and seed as bonsai. Few will be as lucky to work on material such as this, however raintrees do mature quickly, and one can develop a very nice tree in a short period of time with proper care. is the accepted name according to International Legume Database, Missouri Botanical Garden, and the New York Botanical Garden among others. I have noted that there seem to be 2 sub-species of raintrees grown today for bonsai. One has leaflets that are a bit larger, and a bit more ‘bright’ green. This tree also has longer internodes that don’t ‘zigzag’ as much. Both exhibit the same smooth exfoliating bark. In growing raintrees at my nursery the past 5 years I have noticed that this second type roots from cuttings easier. Also Allen Carver notes, and I have observed as well, only this second type produces flowers in our nurseries. Allen states that his oldest original trees his grandfather grew have never bloomed. To the casual observer the differences are subtle, however side by side with close scrutiny you will notice a difference. Whether this is a second sub-species or just a random variant is yet to be determined. tropical to your bonsai collection!